Your child is nearing the end of the Brain Power! science program. Over the last five modules, your child has learned how to use scientific inquiry to perform experiments, how to identify the parts of the brain and their functions, what neurotransmission is, the difference between medicines and harmful drugs, and the effects of nicotine and tobacco on the brain and the body. 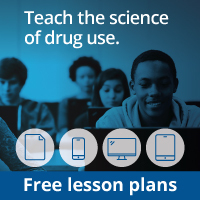 During the last module, your child had an opportunity to learn about how four substances—cocaine, marijuana, alcohol, and nicotine—affect the brain and the rest of the nervous system. To help students complete this task, they received fact sheets about two of the four substances. For your reference, this information is summarized below. Our goal in introducing this material is to provide scientific information about the effects of drugs on the body. By presenting the material to students when they are still young, we hope to lay a foundation upon which they can build ideas as they grow. We also hope that their early exposure to this information will help them make healthful choices about drugs in the future. We encourage you to discuss these issues with your child. Ask your child what he or she learned from the program. What overall impressions has he or she brought away from the Brain Power! program? At school, your child was asked to write down one message that he or she would convey to family and friends after completing the Brain Power! program. Try this activity as a family. What is one message about the brain and drugs that your family would like to convey to others? Then send the message on to a friend and ask him or her to spread the word. Friends and family members are influential people in children’s lives. We believe the more people repeat the message about the harmful effects drugs can have, the clearer the message will be for children. Have your child draw or write something about how drugs affect the brain. The books and Web sites listed below have more information about drugs. Series developed to educate children about the biological effects of drug abuse on the body and the brain. Bellenir, K., ed. Drug Abuse Sourcebook. Health Reference Series, Omnigraphics, Inc., 2010. Basic health-related information about the abuse of legal and illegal substances such as alcohol, tobacco, marijuana, and cocaine. Friedman, D. Focus on Drugs and the Brain. Frederick, Maryland: Twenty-First Century Books, 1990. This book, part of the “Drug-Alert Book” series, includes a section on each drug of abuse and addiction. This site includes a section on the history of tobacco, cigarette smoking, nicotine addiction, and the effect of nicotine on the brain.